Handcrafted by Master Luthier with a Graduate Degree in Physics. Largest Selection of Whamdiddle Bones on the Internet...plus those Famous Laminated Bones! We do our best to ship you matched pairs. We cannot guarantee that a pair will match. But we do make an effort to match them. No other shop does that. What's more, if you order a full set of four bones (two pairs), then we try to match both pairs. Again, there's no guarantee (because this is a teeny-tiny specialty market so our inventory, although the largest on the planet, is not large enough). Still, if you want the best chance to get a matched pair or set, then Bone Dry Music is your absolute best shot. Even if you can find a shop that sells musical bones, there's no telling what you will see when you open the box. That's what sets Bone Dry Music apart from the rest. We do our best to avoid surprises when you open the box. That's why we offer you so many choices...so you have more control over what you get. Here's what we want you to say when you open the box, "Yep, that's pretty much what I was expecting." Thin flat-face design produces remarkable tonal range. 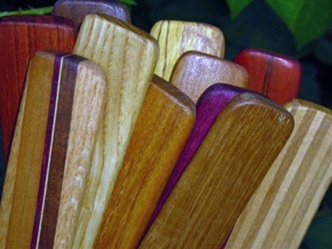 Take a close look at the marvelous color and fascinating wood grain of Whamdiddle bones. The standard design is less oval than minstrel style bones. The shape fits especially comfortable in your hands. But the first thing you notice when you grab a pair is their substantial heft. Even the lightweight bones feel full in your grip. Best of all, Whamdiddle bones deliver a rich full range of tones when you rattle them. These are thinner than standard Whamdiddle bones and they have a flat face. The thin flat-face design enables you to produce a remarkable dynamic tonal range. ...plus those Famous Laminated Bones! On this website is the largest selection of Whamdiddle bones on the internet. No other store offers you a larger choice of Whamdiddle bones that you can view and purchase by simply clicking a button.